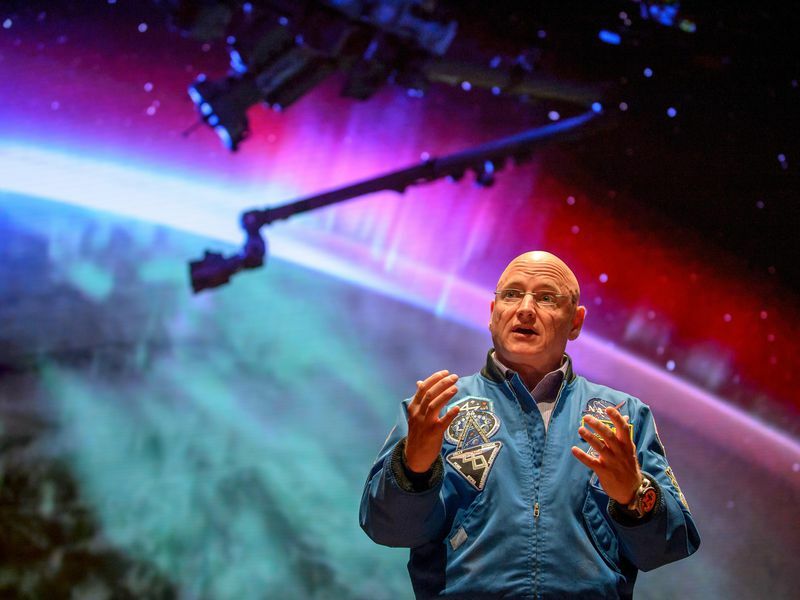 Astronaut Scott Kelly talks about zero-g sleeping and other oddities of spending a year in space. “When I became an astronaut, we were the class that was going to go to Mars,” says Scott Kelly early in Beyond a Year in Space, a new PBS documentary premiering tonight at 9 p.m. EST. “I never thought that was a realistic thing. But the most recent astronaut class could be. I hope they are.” The hourlong special introduces viewers to two of those astronauts, biologist Jessica Meir and naval aviator Victor Glover, who are training for the kind of long-duration spaceflights that will be informed by what NASA learned from Kelly’s historic 340-day mission aboard the International Space Station. A sort of sequel to A Year in Space, the documentary that PBS adapted from a 12-part web video series produced by Time in 2015, the new show picks up the story in March 2016, on the final day of Kelly’s mission. (A Year in Space will be replayed on PBS stations tonight at 8 p.m., immediately before Beyond a Year in Space debuts.) 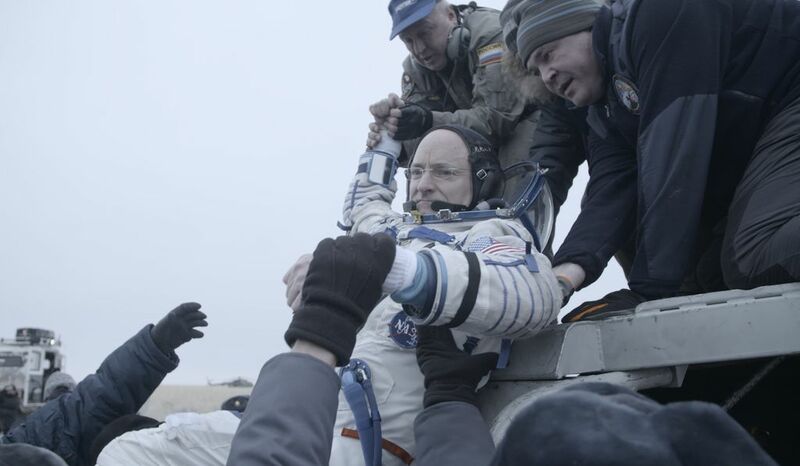 The new program documents Kelly’s difficult readjustment to life on earth after a year in microgravity, as well as the extensive medical tests performed on him and his identical twin brother, Mark Kelly, who served as a control subject. Associate Editor Chris Klimek reached Scott Kelly at home in Texas last week to discuss the documentary and his plans. Air & Space: You’ve been back on Earth for 19 months. How long did it take for you to start feeling normal again, physically, after you got home? Kelly: It depends on how you define “normal” or “fully recovered,” but I would say after about eight months I was completely back to normal. Most of the recovery occurs in the first weeks or the first couple of months. I’m good now. You’re a military man. You’ve always been fit and strong. What’s it like to get home and find your body not working the way you’re used to it working? It’s a little bit of an inconvenience. But that was why I was doing this. It’s not like it was completely unexpected. Some of the stuff was a little bit surprising. But I was an experiment, and this is why we flew in space. It’s not similar to how you would feel if you got injured in a car accident. I wasn’t remorseful. It comes with the territory, I guess. I’m fascinated that the kinds of medical problems that would be regarded as inconveniences here on Earth could jeopardize the success of a Mars mission. Degradation of eyesight, kidney stones, that kind of thing. Did anything surprise you about the physical or mental symptoms you experienced? I was pleasantly surprised in that even though I was up there more than twice as long as on my previous flight, I was well prepared for it. I wasn’t climbing the walls to get out of there. I was happy to be going home, but I could’ve stayed if there was a valid reason. When I got back, I was surprised by the swelling in my legs and the rashes I had; hives and stuff. I didn’t have any of that on my 159-day flight, so that was a surprise. So some things only become problematic after five months. It might’ve been only after 339 days. I don’t know. 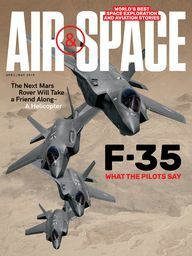 We are an aviation magazine, too, and our readers will want me to ask you what your favorite aircraft to fly is. F-14 Tomcat, the Harley-Davidson of fighters. Now I’m supposed to ask you to name a least favorite. No one’s ever asked me that question. I don’t know. The... Sopwith Camel? I feel like I’m interviewing you for my sixth-grade newspaper with that question. How recently would you have had the chance to fly one of those? I’ve never flown one of those. I remember it from—I took an aviation history class in college. I’m looking it up right now. Oh, look at that! Sopwith Camel! The Brits are gonna hate me. We seem to be on the verge of an era where people will be going into space with minimal training—certainly not the lifetime of prep you brought to this job, as a Naval aviator and then an astronaut. How do you feel about that? I think there will be a place and a type of experience for most people. It’s a harsh environment. Living in space for weeks or months. I don’t think it’s for everyone. But going to space for a few hours, or a day—I’m hopeful there will an experience that most people can enjoy, depending on how adventuresome they are. You’ve spoken of how you eventually stopped having dreams set here on Earth; how after a while in orbit you starting dreaming about being there on the ISS. Have you noticed any change in the patterns of what you dream about since you returned? Not that I can recall. Before this last flight, I used to occasionally have a space dream. When I got to space this time, in the beginning my dreams were more focused on being on Earth. And the longer I was up there, they transitioned into mostly dreams about being in space. As I got closer to coming home, the Earth dreams started to populate my subconscious more and more. Everything I read about life aboard the ISS seems to cite the very burdensome workload upon the crew. Did you ever have what you would categorize as a stress dream while you were up there? I don’t remember that off the top of my head, but I could go back and look at the dreams I had that I wrote down. You kept a log of that? Yeah. I mean, not all of them. But probably about 40 or so. Is that the kind of thing flight surgeons want you to write down, or are you doing that for yourself? After my previous flight of 159 days, I was asked by the brain trust—as I call them—of psychologists and psychiatrists if I dreamed in space. And I said, “Yeah.” And they said, “Do you remember what you dreamed?” And I said, “No, I don’t remember.” So this time I made an effort to wake up and write them down. You knew you’d be asked once you got back? Yeah. It seems like something people can relate to. Most people have dreams. And I was curious, too, what they would be like. And they’re pretty wacky. What’s sleeping in microgravity like physically? Is it easier to fall asleep than on Earth? Is it harder to wake up? I think it’s harder to sleep. When we live on Earth, all day long in our daily lives, we’re opposing gravity. When you come home and lie on the couch, you’re more comfortable than you were at work. When you lie in bed, you’re more comfortable than you were on the couch. I think that change in levels of relaxation and comfort helps you go to sleep. In space, whether you’re working on a computer or doing an experiment or eating or watching a movie—pretty much everything, with the exception of exercising—it’s the same level of exertion, which is nothing. You’re just floating there. So when it’s time to go to sleep, you just close your eyes. For me, it’s harder. There are some things that are good about it. If you have chronic pain—I’ve got bad shoulders and a bad back and neck—those things don’t hurt as much. But you also have new issues. Your spine might hurt in a different way because now it’s elongated in the absence of gravity. Especially at higher altitudes, like on my first flight, for the Hubble Mission [STS-103, December 1999], sometimes you’ll see cosmic rays with your eyes closed. They’re these bright little flashes. That’s kind of a distraction, especially when you consider that that cosmic ray didn’t just hit your retina, it also went through your brain. It’s noisy [aboard the International Space Station]. It can be warm in the crew quarters because it’s difficult to control the temperature. A lot of people think it would be really great to be floating all the time and that you’d sleep better. I sleep better on Earth than I did in space. Especially now. Did you ever talk to Mikhail Kornienko [the Russian cosmonaut who also spent a year in space] about his mission? Do you ever compare notes? We did a little bit, when we first got back. I haven’t seen him or talked to him in about nine months. I need to send him a note to see how he’s doing. I’ll do that today. What do you think is the ideal duration for an ISS crew to spend in orbit? What’s a reasonable length of time before their efficiency might start to erode? I always felt like I got better at my job the longer I was up there. A lot of that improvement happens within the first couple of months. But even towards the end of my flight, I could tell that my ability to work in microgravity and move around was always getting better. And cognitively, I felt like the longer I was up there the more clearly I could think. Certainly there’s sometimes a detriment based on carbon dioxide levels. But I felt like I was always improving. How often do you have to check in to report any symptoms you’re having? I assume you’re all monitored constantly. Do you tell Mission Control you have a headache and they tell you the CO2 is up? How does it work? You have a conference with your flight surgeon every couple of weeks. You also have a conference with the psychiatrist or psychologist. We do physical exams on one another, a medical check. I think that’s probably monthly. You do some physical tests, like a VO2 (oxygen) max on a bicycle, so they measure your cardiovascular health. They monitor your weightlifting sessions. They monitor all your exercise. We also do these tests measuring our cognitive abilities and our ability to concentrate to get a sense of our critical thinking. There are other tests that are more experimental, but kind of along the same lines. I think I may have seen results that indicated maybe my cognitive ability decreased over the course of time, but it’s quite possible that was more of an indication of me getting complacent with the test. Subjectively, I would say the longer I was up there the better I got, but I think some of the data didn’t reflect that. You know, it’s human nature when you do something over and over again for months on end, eventually it’s hard to concentrate. The best I’ve ever done on those tests were the moments when I should have done the worst. Because I knew they were looking at it closely. As an example, after my sister-in-law Gabby Giffords was shot. I think I probably had my best score ever on this test called WinSCAT. I think my highest score was a few days after Gabby was shot, because they were concerned about my ability to concentrate. I knew that, so I put as much as I possibly could into [the test]. I’m going to Google it to help me remember. [Reading.] It’s the Windows Spaceflight Neurocognitive Assessment Tool. It’s a bunch of different tests. One is a math test, basic arithmetic. It measures your accuracy but also the speed it takes you to [solve the problem]. One is a test where you match shapes with numbers. You study those in the beginning, and then you have to say which shape corresponds to which number. I have a book tour that’s going on for weeks. I get a little bit of a breather in the month of December. I just had two books published, and I’m working on a couple of more right now. Sometime next year I’ll start thinking about other things to do to challenge me. Writing a book is not easy, by the way. I don’t know if you’ve ever done that, but it’s a lot harder than I thought. I can’t wait to tell my folks that a history-making astronaut told me he thinks being a writer is hard. So let’s close by discussing your place in history: Do you feel protective of your spaceflight-duration record, or are you looking forward to the day someone breaks it? Absolutely. Records are made to be broken. It’ll just mean we’re expanding our experience base in space. I have no problem with it. Thank you for talking to me, Commander Kelly. I was just joking about the Sopwith Camel. I just remembered the name from my class. I’m sure it’s a really good airplane. Beyond a Year in Space airs tonight at 9 p.m. on PBS stations nationwide.